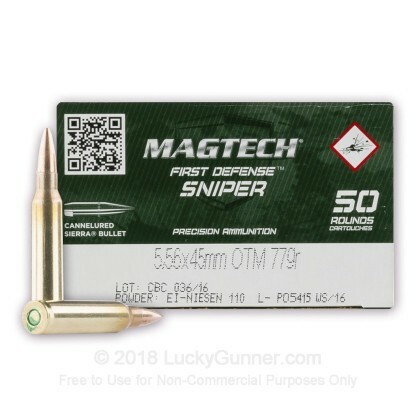 This 5.56x45 cartridge by Magtech is perfect for match shooting, but you’ll no doubt enjoy firing it casually to see just how accurate your custom AR-15 can be. Its bullet is the reason for this -- Sierra’s MatchKing is a real tack driver of a projectile, just shy of being classifiable as a surgical instrument. This bullet’s thin jacket is remarkably concentric, and its weight is standardized within ± 0.3 grains. The bullet’s hollow point meplat does not affect its terminal performance -- rather, that narrow hollow point immunizes it greatly against wind deflection. This MatchKing’s boat tail design amplifies its ballistic coefficient to flatten its trajectory, and its cannelure prevents it from setting back during feeding. A Magtech cartridge evinces all the quality so large a manufacturer is able to deliver. Its first rate casing is made of brass, and thus reloadable several times. Its propellant burns clean to maintain your rifle’s action, and its primer needs to touch your firing pin ever so slightly in order to create reliable ignition. Having used both, I feel the CBC 77 OTM is as good as the Black Hills variety. It is as accurate and cost just above half of the BH offering. As far as effectiveness, at 300 yards it will do what M193 55 grain or 7.62x39 will do at 200, and a .30 Carbine 110 JSP at 100 yards. These shot OK (2 MOA) out of a 1:7 twist AR with 16" barrel. 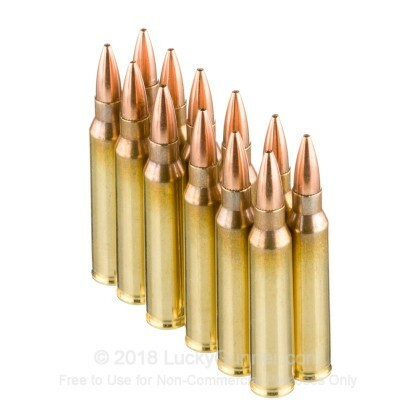 I bought 500 rounds of this but have only fired 30. The transaction, product cost, shipping fees, and shipping were easy, fast, and quite reasonable in cost. There were no issues (FTF, FTE, & etc.) with the small sample that I did test. I was very pleased with how it grouped at 50 yards . 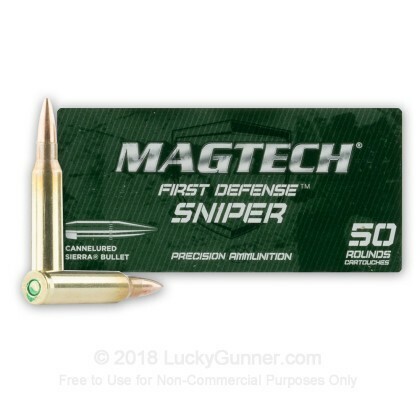 . . not getting into specifics as I am the weak link, but I will say that I shot 8 or 9 different rounds varying in grain (55, 69, & 77 in .223 and 5.56) and this offering from CBC/MagTech provided the best or second best grouping - the main competitor being PPU .223 69 BTHP Match. 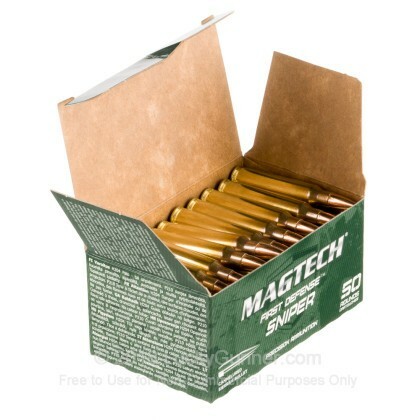 Regardless, this was very inexpensive for 77gr OTM IN 5.56 and I am, so far, quite pleased with my purchase. Had a few defects (smashed bullets, badly deformed cases); 4 of 150. I suppose that's what you can expect from a half price 'match' round, but XM193 bulk produced only 5-7 defects per 1000 so I'm not sure if that's an improvement or not. I'm hoping to see effective results in the round's performance, but if the exterior quality control isn't 'match' level I'm not going to hold my breath very long. Great stuff. Can't wait to buy more. What a value! I purchased 4 boxes of this to try out in my 1/8 twist Rock River Predator Model. I was 1" high at 100 yds with 50 grain vmax Fiocchi ammo. My first 5 shots of this was 4" high and 4" left. I made the adjustments and this stuff shoots really good. My largest group was 1.5" @ 100 and my tightest was .75" @ 100. I get about the same results with the Fiocchi 50 grain vmax, but i like the idea of 77grains hitting my "targets" better. I hope Lucky Gunner keeps this stuff around for a while. I want 500 more rounds!!! 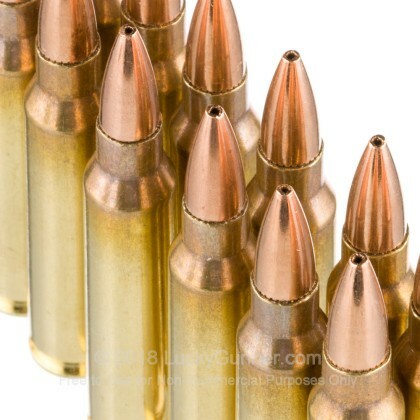 Q: What is the initial velocity in feet per second of this 5.56 77grain OTM bullet? A: Hello Larry, The muzzle velocity of the 77 grain OTM round is 2750 fps.